Longhorn soccer players celebrate a goal versus Montana earlier in the season (Photo: Bethany Walter/Univ. Of Texas). Texas women’s soccer has been tested this season, excelling with freshman talent and suffering a few tough loses. At the end of the season the Longhorns have an overall record of 10-7-4, 4-4 in Big 12 play. After their win in the exhibition game against Incarnate Word in mid-August, the longhorns traveled to Honolulu, Hawaii for the Outrigger Resorts Shootout against Arizona State University and University of Hawaii. The longhorns tied with Arizona State and won against Hawaii. The longhorns felt confident in September going into their second tournament, the USF Soccer Classic in Tampa, Florida with back to back wins against Texas A&M Corpus Christi and University of Montana. After a battle in two matches, Texas lost the tournament to Central and South Florida. Amidst the season, freshman forward Olivia Brook kept proving her talent in the early start of her college soccer career. Brook leads Texas with six goals, and a total 14 points with 27 shots along with her two assists. During conference play Texas went 4-4 with signature wins coming over Texas Tech and Baylor. 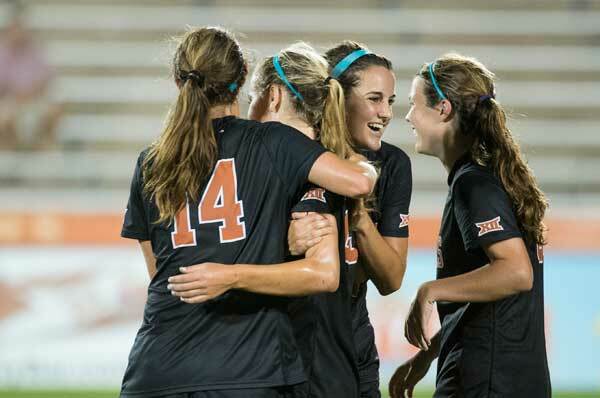 Texas won their match against Texas Tech with penalty kicks 6-5 in round one of The 2014 Big 12 Women’s Soccer Championship on Wed. Nov. 5. Both teams were determined to come away with a win on Fri. Nov. 7 when the longhorns played West Virginia. The Longhorns now await their NCAA Tournament fate as the annual "Field of 64" will be announced live on NCAA.com at 3:30 p.m.on Mon., Nov. 10.